We would like to recommend that you take a trip down the Romantic Road. Perhaps a river cruise on the Rhine, Danube or other rivers? How about a hike through the Black Forest? Better yet! Why not hop a train and site see from destination to destination? 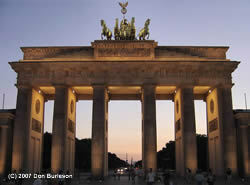 Germany has so many sites to see and things to do, I could definitly go on!